﻿ Wondering what Mommy Homework is??? Each week you will have an “assignment” here to share in our comments here on this site. You will love this-both sharing AND enjoying answers by others. Some of them, I compile into an ebook (contributors can resell as a product of their own–be sure to submit your email and full name when you register so I can credit you appropriately!). We get to know each other…we are encouraged in our journey…and we glean super ideas from other great moms! Ready for this week’s MH? This is going to be a fun topic! This week, we are welcoming Debora Coty, author of the new book Too Blessed to Be Stressed, to my Mom-to-Mom Radio Show. Debora’s book is so incredible! It gives a plenthora of ideas for navigating the stresses in life. Our topic for the show is going to be based upon the book and give LOTS of ideas for destressing in the midst of all that life can throw your way. You will not want to miss this show! Just learn more about joining us or listening to this show here: CLICK HERE. Oh! And, if you want a treat, click here for a an Excerpt on Time Management. Since destressing and navigating the stresses of life is on my brain this week, I thought that it would be the perfect topic for our Mommy Homework this week. Do you struggle with navigating the stresses of life? How do you keep a smile on your face and gentleness in all you do during those times when things are falling apart around you? How do you keep your focus on the MAIN THING when there are so many distractions, interruptions, crisis situations, and downright chaos all around? Just jump in and share your wisdom today! OH! And, don’t forget to come back and enjoy all of the other mom-to-mom ideas and words of encouragement! I think this is going to be GOOD! PS! Please remember to use your real name if you want credit for your Mommy Homework Credit. PPS! You CAN just share and not participate in Mommy Homework, BUT I would LOVE for you to get some goodies along the way! PPPSS! If you are new, all you do to share your MH is first register (see the link on the bottom of the page–scroll all the way to the very bottom), then log in with your name and password that you select. Share away! Join Cindy Rushton as she blogs right here from Cindy's Desk(TOP!)! Catch up with the Rushton Family, read Cindy's potpourri of articles, find out about new links on her website, and stay abreast of upcoming events and projects! Grab your cup of tea. This will be a fun part of your day! Do you struggle with navigating the stresses of life? You bet! There is always way to much to do and i feel i have to do it all. 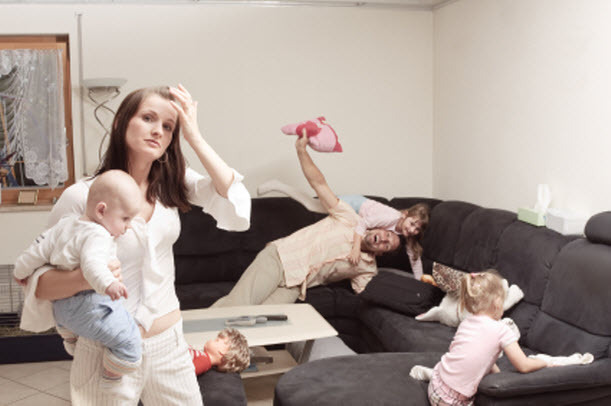 How do you handle them?I clean, nothing bets stress like being in a clean, tidy area. How do you keep a smile on your face and gentleness in all you do during those times when things are falling apart around you? I don’t know I’m working on that. Gentle is not my strong point at all. I’ve started taking time outs to try and get myself back together and calm before i go forward with my day. That really helps a lot. How do you keep your focus on the MAIN THING when there are so many distractions, interruptions, crisis situations, and downright chaos all around? Just keep thinking of why your doing what your doing and who your doing it for. I look forward to trying this out. I’m reminding myself of these things as I type!! I’m not stressed so much as ‘not feeling incontrol’ just at the moment. The bottom line for me is discipline. If I am disciplined to get up in the morning and have the time I need with the Lord and preparing mentally for all the day ahead will bring then I am much less stressed because I am proactive about things rather than reactive. When I know clearly what needs to be done, or even just what I have planned to do, then I am much more effective in my use of time, much less prone to distractions or procrastination and I feel much more satisfied at the end of the day. By being organised I don’t have a lot of things hanging over me or ‘sneaking up’ on me. This means I am less likely to be snappy with the kids and my hubby too. I know there are lots of other things in the equation, but being disciplined to plan and have a clear idea of where I am going with my day/ week/month is a big factor. Expressing love to the ones who are STRESSING me out 🙂 with hugs – or a group hug! A cup of hot tea (has to be Vanilla Rooibos)! Sometimes, with lots of little ones around (and big ones! ), it is not possible to go to my room, go for a walk, or whatever; I need something FAST! Usually changing the atmosphere by lightening up, smiling, tickling, etc. does the “quick” trick. Another coping mechanism: I sometimes send the kidlets to different parts of the house to read (big ones reading to little ones) while I accomplish something with a little bit of peace – and speed! I do want to mention for those who may be battling serious depression, that when I have struggled (severely) with this, only a few things have really gotten me through. 1. Reading, quoting, meditating on, and praying God’s Word. This, during times of severe depression, may be moment by moment. We have been struggling to get out of debt for so long that the stress seems normal. Finally, I realized that I have been living in sin having this debt looming over my head. God does not want us to be a slave to anything except to HIM. Once I came to that realization, my mindset changed, and I look at reducing our debt as a ministry to the LORD. It pleases Him to see me doing what is right, and that keeps me focused on the goal. A little note about my attitude: When I am grouchy and harsh, it seems to zap all my energy and my money! Yet when I practice a quiet gentle spirit, I am able to do more and money seems to stick around longer. Do you struggle with navigating the stresses of life? Yes, I struggle with stress ALOT and react in ways I’m not proud of. How do you keep a smile on your face and gentleness in all you do during those times when things are falling apart around you? Honestly I don’t have a smile or gentleness when I’m stressed. I am trying to learn to. Looking forward to learning from the other ladies here. How do you keep your focus on the MAIN THING when there are so many distractions, interruptions, crisis situations, and downright chaos all around? I need to learn this too. I let stress drown me. I definitely struggle. I don’t always handle things well at all. Being a severe hypoglycemic, the first thing I have to do is make sure I’m eating right. Hubby & the older children tend to follow me around the house with food. I forget to eat! I get so stressed and so busy, I just don’t want to take time! No, I’m not skinny. When I finally do eat, it’s not the right stuff or I overdo-it… So, I look at my diet first. Whole grains, fresh vegies, plenty of protien… Am I remembering to take my vitamins? Am I getting enough water? Have I been sleeping well? Keeping focus is hard, but remembering the MAIN THING is our relationship with the Creator of the universe. …not the house, or academics, or even meals. HE is the most important thing, and teaching that to my children through example even if it’s on my knees crying in the middle of the living room floor. 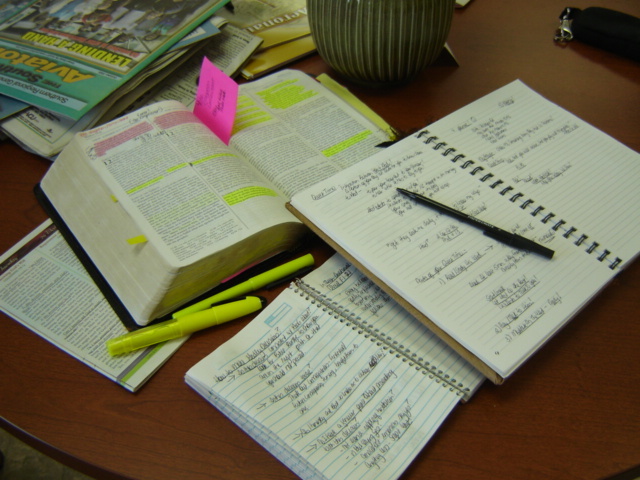 I MUST cry out to God to help me focus… What is HE teaching us through this situation? What does HE want me to do? How did I get into this mess in the first place? Once things are in perspective, usually the big problems of life don’t seem so monsterous anymore. Next to my GOD, what can we not do?? Stressed? Who’s stressed? Everyone! LOL. I don’t know of one person who doesn’t claim this encumbrance on their life. What we do about it is what sets us apart though. Do I do it right all the time? Heavens no! Do I do it half the time? I don’t think so either. Do I strive to accept life’s potholes and drive over them with contentment? Yes. We have to just keep looking in an upward gaze to keep us from tripping over our own two feet! I tend to get stressed out by the “little inconveniences” in my life…I’m working on being more patient when things don’t go according to my plan. I tend to do better with major crises…I stay pretty calm then. I wish that I was better at keeping a smile on my face and gentleness in all I do…when I fail at this, I usually ask for my family’s forgiveness after I ask for God’s. 🙂 I stay focused on the Main Thing by getting as organized as possible so that when things get crazy, I have a plan to fall back on…and I pray A LOT!!! Stress. Agh! How timely a subject. We just put our house on the market and my husband starts a new job in a new state in 2 1/2 weeks. This will be our 9th move in 12 years of marriage. Our 4th state. Our 6th move since having our first child 10yrs ago. I should be an expert and have moving down but it still stresses me out. This is also our first year of homeschooling. I just started homeschooling my youngest daughter for first grade and planned on adding my 2 older daughters next year. Now we plan on homeschooling all three when we get moved. I am looking forward to reading others responses. I agree with Mary exercising and a few alone moments in the bathroom. Prayer and asking others to pray for me. My issue is when life gets too busy. How do I keep my mind from being busy along with it? I’ve learned the being in silence helps. no noise, no chatter, just silence. If life is stressful, I make the point of saying to myself….Just be KIND. if you can just be kind it will all work out. that and talking with God. he’s real good at helping me keep my focus where it aught to be. Talking with God. Talking with my family. That’s what is the main thing. and if we have to stop and just be silent, that’s what we do. Do you struggle with navigating the stresses of life? YES! I don’t like the unexpected. lol. We’ve had a TON of stress this summer that just kept coming day after day and it was difficult. I got worn down. How do you handle them? I get grumpy. I get on my knees. I take naps. I cry. I eat. I think it depends on how far into the stresses we are. Early on I pray a lot and get into the Word, and then I start getting tired (literally and in every sense of the word) and start losing steam. How do you keep a smile on your face and gentleness in all you do during those times when things are falling apart around you? Sadly, I don’t. Gentleness is something I pray for. Which is probably why SOME of the stresses come – so God can build up my gentleness. I tend to get cranky and irritable instead. How do you keep your focus on the MAIN THING when there are so many distractions, interruptions, crisis situations, and downright chaos all around? After a good rest (nap or sleep), I tend to braindump first so I can clear my head. I get into Psalms. (I love David!) And I journal and pray during some quiet time. Worship music has a way of lifting me up and keeping me focused on the MAIN THING. 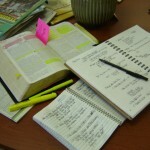 My favorite thing is to visit our Christian store cafe – a nice cup of coffee and time to sit and do my reading / journaling. When I let go of all the stresses – and my attempts to control them – God steps right in and I find rest, even if circumstances don’t change… THAT gets my heart focused on the MAIN THING and life is sweeter even in the midst of trials. Okay, I am listening to the PJ party as I write this, Cindy you just said we all have the same amount of time, technically yes, but practically that is just not true which is one of the main things that adds to my stress. A person who is relatively healthy just has more usable hours in a day. They need less sleep and have more energy which automatically adds more hours to their day than I have to use. I have multiple health issues and care for a disabled husband which just means less usable hours. I read these questions I copied below and say, I really don’t know how to handle the nonstop stresses in my life – the series of crisis that have defined the past 10 years of our life. I REALLY struggle to navigate the stresses of life. I am so exhausted and worn out, the Word is just not refreshing me, prayer is just not refreshing me. There is so much that needs to be done in. my house and my yard and it is time for school to start and I am not ready – nothing is organized and I just realized the summer is over and I have had precious little fun with my family. Then I realized, I just don’t let myself have fun with my family. I know that relaxing and having fun with my family, or just taking time to relax myself definitely helps deal with stress. I realized about a week ago, as I was feeling so terribly run down, that I never let my self relax and have fun b/c there is so much to do and not enough of me to do it so I feel guilty anytime I relax and have fun. I feel guilty now b/c I am on the computer listening and typing when the few hours I felt decent today I spent with a new friend, and took the kids swimming and therefore have not gotten cleaning and organizing and laundry done – and those are things that just have to be done (if this was the last day of my life, I would not do any cleaning! but it does have to be done! You can’t just let it all go!) I realize guilt is highly unproductive. But it is how I feel. I also have recently realized I don’t smile much. I used to be a happy person. Now I am just a stressed out wife and momma. Most of the time laughter takes more energy than I even posses! So I am trying. I did spend time with a friend and take the kids swimming. (but I still don’t know when all the work I should have been doing will get done). This is a terribly depressing post. But it is truly where I am right now. I am trying to relax and listen now, which are doctors orders after I put the kids to bed, to relax to help deal with my insomnia and restless leg issues. I am trying to give God the guilt I feel for relaxing, and praying God will help me learn how to navigate the life he has given me in a better way. Do you struggle with navigating the stresses of life? Yes, I feel like I have to be supermom. How do you handle them? I just thank the lord everyday. He gave me patience. How do you keep a smile on your face and gentleness in all you do during those times when things are falling apart around you? At times it is hard but I try to remember what ever it is falling apart I will soon fix it. My mom told me recently, I wish I was as strong as you because I don’t know how you do it. How do you keep your focus on the MAIN THING when there are so many distractions, interruptions, crisis situations, and downright chaos all around. Take a small break and when I step back in to the situation it looks different, somehow better and easier to deal with. Wow, stress…I live with it day in and day out! How I do? 1. I ask the Lord to help me through each and every day. Without HIS help I couldn’t make it!! 2. Through Cindy’s get-to-gathers, I have met some awesome people – one of them recently moved here and has become part of our family, the other one has become a close friend of the family. When things aren’t going good, I know that they are there for me. 3. I have recently (over the past 6 months) started having my own control journal that helps me know what I’m supposed to do each day. No, I don’t get everything done always, but it helps me to keep going. 4. I have begun planning meals out for a month and we go grocery shopping once a month. Instead of not knowing what is for a certain meal, anyone in the family can go look for themselves and see. 5. Splitting jobs up among everyone in the house helps to keep not everything being on my shoulders. 6. I enjoy listening to music to help me not be so stressed out. When things start piling up as they do around our house, I look around and remind myself of all the blessings God has given me. I have a wonderful husband of 17 yrs. We have been blessed with 3 children to hold here on earth and 5 to meet in Heaven. He has given me a service dog for our youngest son, given us a wonderful therapy crew. He has blessed my life with Cindy Rushton and Felice Gerwitz and all the people on their chats. Yes, counting our blessings does help break the stress. Thanks Cindy for this retreat week. You have been a blessing during a rough time!! Truly blessed even in stressed times! Wouldn’t you know that the first of the week when I saw the mommy homework that, Cindy would pick this topic for this week. I had just gone through some emotional stress. Right in the middle of it I picked up a book by Charles Stanley, opened it to where I thought I had left off, it was on emotional stress and learning lessons from the Lord with things I need to do. This is oh so hard to learn and do. Most of my stress now is just plain emotional. I can remember years ago when I would get upset and stressed out, I would start ironing (that was way back when you ironed all your clothes); I could make that old iron fly. It sure did help me get cooled off back then but now I don’t iron except for sewing projects. Now I have to put myself into a project I am doing and try to forget everything else. You sure can get a lot done this way. Another thing I have done and still do is to go for a walk or just outside, find a nice spot under a tree to be alone with the Lord. Now with this new information, that was probably the second time around, but I guess it didn’t register and get through the first time. I guess I wasn’t listening close enough to the Lord so He brought me back to it in the mist of my stress. There is so much more in his book but to sum it up, I need to remain steadfast, be joyful that God is at work in my life. I need to thank Him for the time my stress will be over. He is with me every step of the way. I need to ask my self, is there something I did, is there confession to others I need to make, most of all confess any sin in my life to Him, so God can work in and through me. To do this I need to be alone with Him. The only true answer to stress. All the physical things we might choose to do to relive stress does not really get to what we are in real need of. Time with our Lord and Savior. 1. Do you struggle with navigating the stresses of life? Stress is like waves . . . occasionally a tsunami threatening to swallow us alive, more often dark and crashing waves, sometimes just peaceful ripples. Life in a fallen world will never be completely without problems, but even the smallest of problems (like a calm sea) can drown me if I’m out there trying to tread water on my own. Yet when I take the hand of the One who made the sea, even the wildest storm becomes calm, and I can walk on water with Him. Yes, I sometimes struggle with navigating the stresses of life—simply because I am trying to navigate them myself instead of placing my faith in the Lord. 2. How do you handle them? 3. How do you keep a smile on your face and gentleness in all you do during those times when things are falling apart around you? Don’t skip Bible reading and prayer. It’s when life is busiest and most stressful that you need it most. Cry out to God in prayer and trust Him to change what you cannot . . . or at least to change you in the process. Take your burdens to the Lord and really leave them there. Then thank Him for as many things as you can think of, including salvation, life, family, and even the trial. Find other ways to encourage yourself in the Lord (I Sam. 30:6). Read biographies of great Christians. Seeing how others maintained joy through great suffering often puts our little trials in perspective. Learn your favorite hymn by heart, and sing it while you wash dishes or anytime you are tempted to worry. Write out some Bible promises on index cards and tape them up where you can see and repeat them several times a day. And above all, remember that this world is not our home . . . if we truly know the Lord, all else can be washed away and we will still be settled and secure on the Rock, Jesus Christ. 4. How do you keep your focus on the MAIN THING when there are so many distractions, interruptions, crisis situations, and downright chaos all around? First, focus on relationships. When you come out on the other side of this trial, what will your family remember? A grumpy, distraught mom who yelled a lot, or a wife and mother who smiled at, prayed for, and served them even through her tears? Take time to rub your husband’s back and feet, or willingly do some other favor he asks for. Your to-do list will still be there five minutes from now, and you’ll have a happier husband! Smile at your children. Sit down and read a story with them. The natural and easy thing to do in stressful times is to focus on self and how bad, tired, or discouraged we feel. But joy comes through serving others—denying ourselves and putting others first. Second, simplify. Put meat in the slow cooker once or twice a week and use that for sandwiches, casseroles, etc. for the rest of the week. Cancel all but a few email subscriptions, and toss junk mail without reading it. Clean the junk off your dresser and bathroom counter—all of it—and put a fresh flower or even a leafy stem from the yard in its place. Don’t feel pressured to have extravagant birthday parties or picture-perfect Christmas decorations just because your friends do. What one or two traditions would be most meaningful and remembered by your children twenty years from now? Do those and forget the rest. Step back and take a broad view of whatever is complicating your life and frustrating you, and pray for wisdom to simplify. Most of all, trust the Lord to use these trials for His glory and your good. He will bring you through, and one day you’ll be able to look back and tell others of His grace! ■Do you struggle with navigating the stresses of life? I sure do struggle. Every day. I have a 2nd grader to homeschool and an 11-month-old who demands a lot of attention. Not to mention the housework which I just try to manage. ■How do you handle them? I just try to realize that I can’t be perfect. ■How do you keep a smile on your face and gentleness in all you do during those times when things are falling apart around you? That is a struggle sometimes. But I rely a lot on my husband. He is my rock when I need a shoulder to cry on. ■How do you keep your focus on the MAIN THING when there are so many distractions, interruptions, crisis situations, and downright chaos all around? I try to get in at least some Bible reading every day. This keeps my mind on God and His expectations of me and what He is doing.